[ D R A W I N G S - S P A Z I E R G A N G W I S S E N S C H A F T ] . 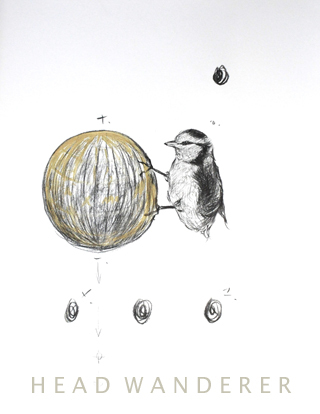 D R A W I N G S : W A N D E R L U S T [pencil drawings on acid-free writing paper 21 cm x 29,7 cm]. [Wanderlust] Drawings on writing paper 2015-2017 [download pdf file]. 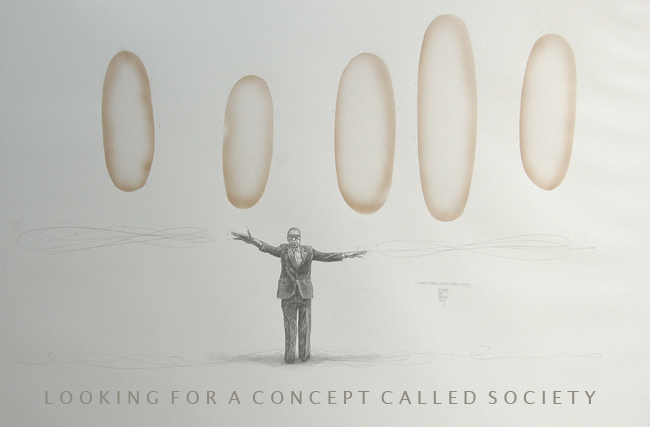 D R A W I N G S : H E A D W A N D E R E R [conté & charcoal drawings and copper paint on paper]. Head Wanderer Drawings [50 cm x 65 cm]. 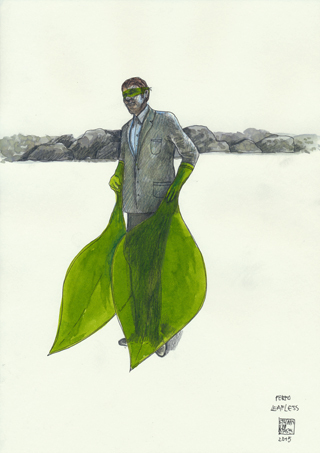 A series of drawings since 1990. Paper: Hollands Van Gelder. [download here pdf file of these drawings]. 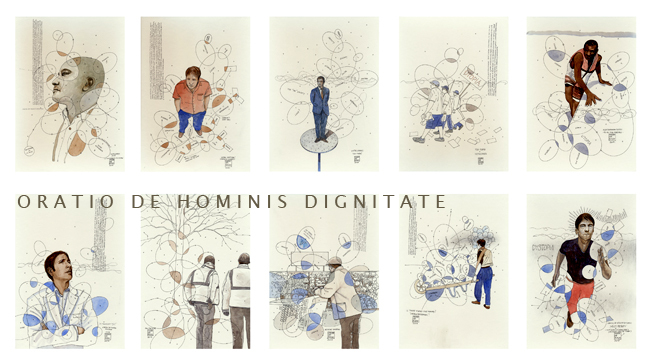 [Oratio de Hominis Dignitate] Nederlandse versie 2016-2017 [Download pdf file]. [O Passeio Branco] Spaziergangwissenschaft Lisbon Portugal 2013 [21 cm x 29,7 cm] [download pdf file]. [The Dürer Connection - Archetypes] a hidden agenda 2009-2010. Watercolour on paper. [21 cm x 29,7 cm] [download pdf]. S T U D Y - D R A W I N G S .
[Obstacle/Passage/Obstacle]. Study Geboortepark Zwijndrecht Belgium 2017>2018. Sculpture/permanent installation public space for a birth park of the community of Zwijndrecht in Belgium. Installation / Reconstruction of the little gate on the painting of Hieronymous Bosch [1450-1516]: 'the lost son'. (Museum Boijmans-van Beuningen, the Netherlands). A symbol of rebirth and change. 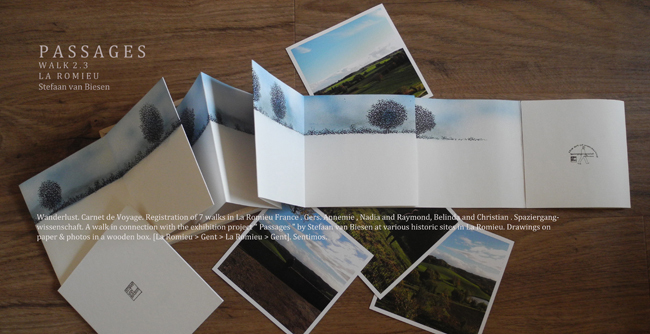 [Wanderlust] Watercolour on paper - S&H De Buck Ghent 2013- Passages La Romieu 2016 [download pdf file]. S T U D Y . D R A W I N G S / M I X E D . M E D I A [a nomadic museum of drawings]. Drawing paper in our bagpacks. A nomadic way of making drawings while travelling and working in situ. Then left at the place where they were made as a gift to one who was our host. These works are always made on site in relation to the place and within the context of the host's intimacy and living environment. Mostly it are people who are contacted and chosen for their art historical importance allthough they lived in anonymity: for example, intimate friends of late German iconic artist Joseph Beuys like Rhea Thonges Stringaris and her friends. The nomadic aspect of the renaissance artists, who travelled all over Europe like Albrecht Dürer [1471-1528]. Journeys become art projects, laboratories of thoughts. 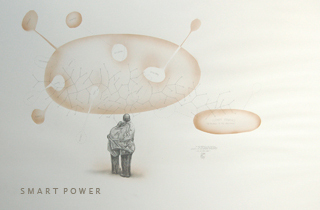 Drawings and other artefacts arise from encounters. Notes, artefacts and drawings embellish the journey. [the Dürer Connection]. The house of Niki Fröhling Amsterdam NL, the house of Dr. Rhea Thonges Stringaris & Ingrid Pee Kassel 2007, Velha-a-Branca Cultural Centre Braga Portugal 2010 & Museu Nogueira da Silva [How long is Now?] Braga Portugal 2012, The house of Jany Niemeijer & Bert De Rijcke, De Leegte Nieuwolda NL 2010, Art Athina Athens 2015. [Whispering (I)] & [Leafless]: 2 Studies performances Urban Emptiness Nicosia Festival 2017 [21 cm x 29,7 cm]. 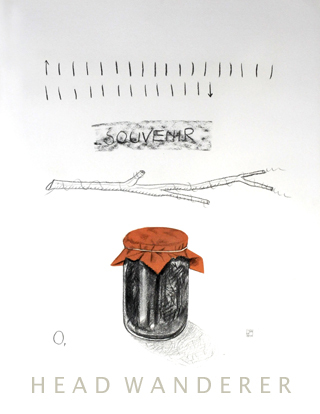 Drawings as a study for a performance [or attributes created for and used during these events] are often used to understand the problems involved in certain actions in relation with the philosophical background of the subject. Also to plan the elements to be used in the process of making performances [or works], such as light, color, form, fabric or material and how they relate to the place, to the body, the audience, as a gesture of silence or as an urban ritual and the scope of their intention. These drawings meant as a study, can have more impact than more-elaborately planned work, due to the insights the artist gains while exploring the subject. 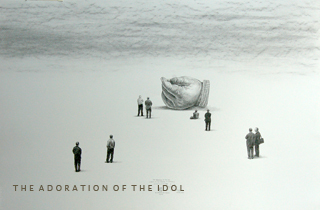 [the snail of time] study of a performance 2004 [pencil on paper : 98 cm x 42 cm, self portrait]. M O N O L I T H .
[44 cm x 111 cm]. Colored drawing. Pencil and bister on paper. O N E D A Y W H E N I W A S W A L K I N G .
[44 cm x 127 cm]. Colored drawing. Pencil and bister on paper. An ongoing, current project with Dr. Shaomin Xue [China/Belgium]. Shaomin xue is a Chinese doctor, who teaches and is practicing Chinese medicin, influenced by her homeland, the philosophy of Confusius. In China writing is considered as art. The drawings and watercolours of Stefaan van Biesen are a field of thoughts and combine two cultures, making connections with different views. Merci Marie Petronelle. Cyclus. A family story. [Mercie, Marie Petronelle] China Art Archives and Warehouse Beijing China. curator: Frank Uytterhaegen. P A S S A G E S : a travelling nomadic museum / boxes with drawings. A series of small wooden boxes of nomadic drawings of the landscape while walking and observing the region. The precipitation of an artistic and philosophical process by making walks. Sometimes artifacts, video and photographs are included. Even text on the drawings as travelling notes. This nomadic aspect of making work during travelling is related to the renaissance artists, who travelled all over Europe like the German artist Albrecht Dürer [1471-1528] did. Journeys become art projects, laboratories of thoughts. 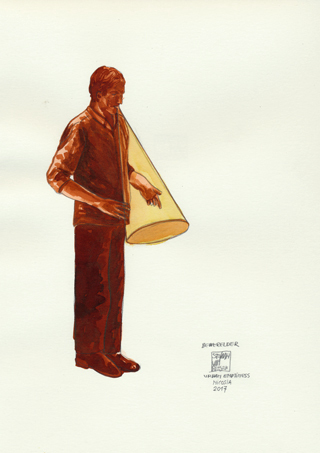 Drawings and other artefacts arise from encounters. Notes, artefacts and drawings embellish the journey. [the Dürer Connection]. 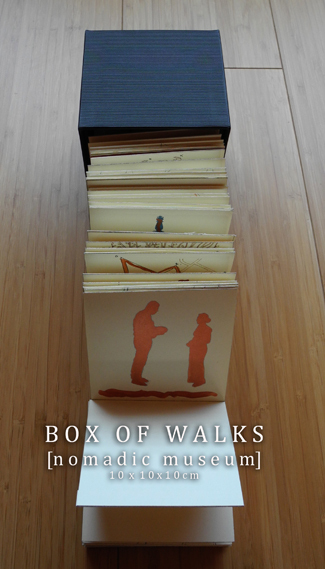 B O X . O F . W A L K S .
The Box of Walks is an artifact of a nomadic museum of walks [drawings, prints, maps, painted figures], that are displayed in situ for a limited time. It is taken in the luggage of the artist on the go and shown to the public when the opportunity arises. [ R E C O N S T R U C T I N G ] T H E V O I D [ 2 0 1 0 ] . Detail. In situ installation with cut out drawings on paper Stichting Kunstforum De Leegte Nieuwolda NL.